As temperatures continue to rise, our furry friends will have additional time outdoors. With this comes the opportunity to discuss common summer pet hazards. Common issues for which pets present to the hospital include heat related injuries or illnesses, allergic reactions to bee stings or insect bites, allergic skin disease, plant ingestion, trauma from being off leash (particularly being hit by cars and dog fights), those easy to blame fertilizers and pesticides, swimming related health hazards, and pet hazards commonly present at your family BBQs. Whether it’s a walking on a hot sidewalk, being out in sun, or in a car, our pets cannot tolerate high temperatures as well as many think they can. When in doubt, think about if you would put yourself in the position your dog would be. I know I wouldn’t want to walk barefoot on hot pavement, sit in a car in 100 degree heat, or be out in the sweltering sun for hours on end. Heat stroke is often fatal, not to mention extremely expensive to treat if a patient needs to be hospitalized. Target shade for walks if possible, as this will limit your dog’s exposure to hot pavement, higher temperatures, and sunburns. Keep walks short during hot weather. Although most reactions are mild and often limited to hives and facial swelling, some can be more severe and include vomiting, diarrhea, and trouble breathing. Often times, we never know what caused the reaction but it is usually caused by insect bites or bee stings after a pet was outside. Regardless the cause, the good news is that it usually resolves with steroid and/or anti-histamine injections and some medication to go home. Usually the problem resolves within a few hours, however sometimes signs can persist for several days. Both flea allergy dermatitis and environmental allergies are very common causes of itchy skin in our pets. We tend to see this more and more when the warmer weather hits. Although we may not always see fleas or flea dirt (flea feces) on your pet, even a single flea bite can elicit a reaction in some patients causing itching. For this reason, fleas cannot always be easily excluded as a cause for a pet’s skin issues. Using a veterinary recommended flea and tick preventative on every pet in the house is very important to prevent fleas and their associated problems. If your pet has itchy skin in the warmer months, but not in the winter, it is more common that environmental allergies are to blame. Although antihistamines can be helpful for treating this, some pets may need a stronger oral or injectable medication to help keep them comfortable. Dogs will be dogs and eat anything and everything. Although some dogs ingest grass because they are nauseous, this is not always the reason. Sometimes they just like to eat it. Clearly there are more toxic plants that are out there however. It is sometimes impossible to prevent, but if your pet ingests particular plants, they can become very ill, and not uncommonly may require hospitalization. If your pet ingests a plant, do your best to find out what the plant is, and if you have any concerns you can browse the ASPCA list of poisonous plants (https://www.aspca.org/pet-care/animal-poison-control/toxic-and-non-toxic-plants), contact the ASPCA poison control hotline, or bring them to your veterinarian. Dogs often times get out of the yard off leash. As an emergency veterinarian, I commonly see dogs hit by cars and dog fights that result. No one likes weeds and we all want a bug free zone to enjoy our lunch on the patio. We often use these products as a result. If an animal ingests these products, they can become sick with gastrointestinal signs, neurologic signs (tremors/seizures), or other serious clinical signs. As with any ingestion of a toxic substance, find out the name of the ingredients and contact animal poison control (888-426-4435), or have your pet seen as soon as possible. Dogs commonly get issues secondary to swimming including ear infections, swimmer’s tail (painful tail from overuse), and GI upset from drinking chlorinated pool water. If your dog is going to go swimming, make sure they have been taught how to get out of the pool and limit their time in the water. If you’re like me, you love to give your pet a nibble of what you’re eating. Be careful with what you share with your pet, as sometimes this is all it takes to cause an issue to arise. Some common BBQ foods such as corn on the cob and meat with bones can lead to gastrointestinal obstruction, which requires surgery. Fruits with pits can be a hazard for choking and also toxic in some cases. As a rule of thumb, almost any food given to an animal can potentially lead to vomiting and diarrhea as well. At my hospital, Mount Laurel Animal Hospital, we are open 24 hours and know that emergencies can happen at any time of the day or night. So, its important to know your local 24-hour animal emergency hospital and even put them in the contacts of your cell phone. Emergencies can be very stressful but staying calm and being prepared can make all the difference. 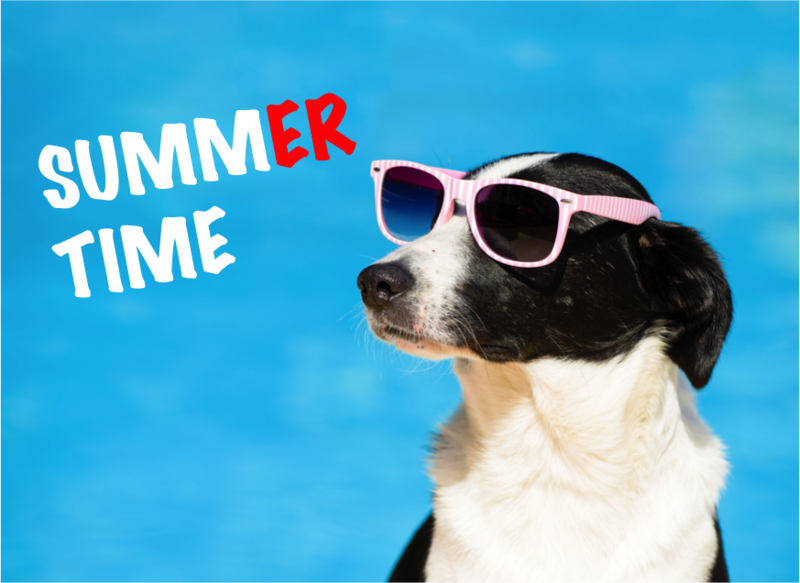 We hope this article has helped you and that you have a safe and fun-filled summer with your pet. ⟵Is Your Pet Under The Weather? KNOW THE SIGNS!